This simple (and currently free) program finds empty folders on your computer. There are many solutions for this task around, but they all lack one important capability: Folders that appear empty but yet contain a hidden ".DS_Store" file are not found by them. Therefore, this tool considers a folder empty even if it contains just a .DS_Store file. To find such effectively empty folders, drop your hard disk icon or any other folder you want to seach onto its window. 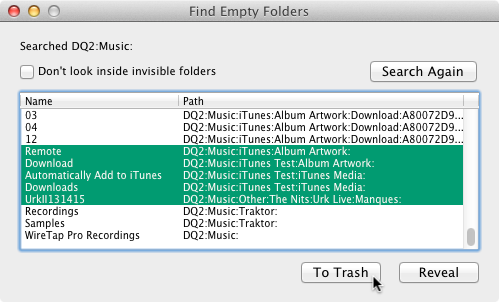 It will then list all the empty folders, and you can then Reveal them in the Finder or Move them to the Trash.